The program can be experienced in 16 weekly 3 hour classes or over four weekends, with weekly small group facilitation and support. It can also be taught as a nine day intensive, with a four month follow-up or as a 16 week online series. 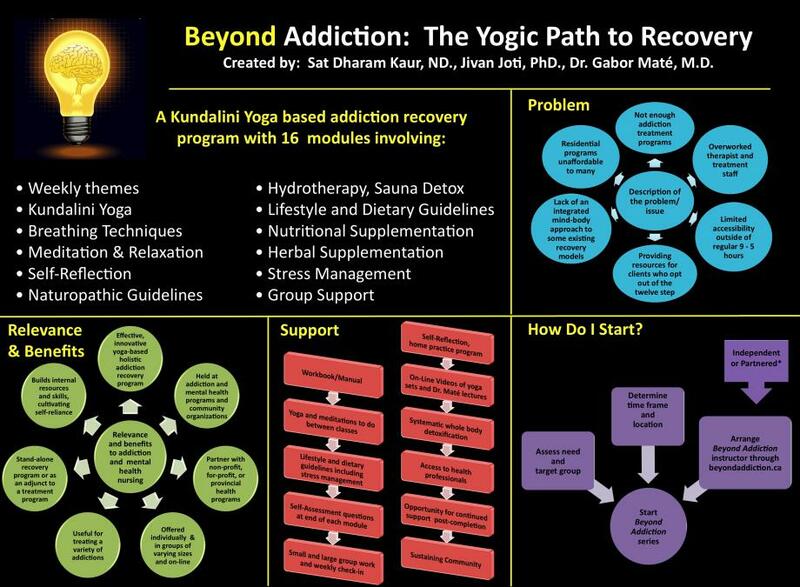 The videos and module materials are available only to individuals currently registered in a Beyond Addiction training, either in person or online. Module One: I am a Spiritual Being Having a Human Experience. Module Two: I Live by My Values and Develop My Virtues. Module Four: I Practice a Yogic Lifestyle to Free Me from My Past and Access Wisdom. Module Five: Act, Don’t React: I Take Control Over My Reactions to People and Events. I Gracefully Receive the Energy of the Divine Floating Around Me. Module Six: Happiness is My Birthright. I Clear My Subconscious to Become Neutral. Through Commitment, Discipline and the Power to Sacrifice, I Achieve Happiness. Module Eight: I Choose Dharma Over Karma. Module Nine: I Replace Addiction with Self-Reliance. I Compassionately Re-parent Myself. Module Eleven: I Change My Attitude into a State of Gratitude. I am a Liberated Being. Experiencing one’s spiritual essence. Recognize unhealthy thought patterns that have been created from past experiences, while simultaneously acknowledging your spiritual nature. Breathing exercises to facilitate left/right brain integration and to activate the parasympathetic nervous system. Yoga exercises to develop flexibility in the spine, energize the chakras, and balance the first three chakras, which govern the instincts. Meditations to break habit patterns and to tap into guidance from the universal energy field. Meditation to link the finite self with the Infinite Self. Simple techniques for cleansing the colon. Discussion about the effects of stress and how to manage stress. Discussion of the importance of developing the frontal lobe of the brain to decrease addictive behaviour. Exploration of values and virtues and discussion about commitment and action to uphold values and virtues. Breathing techniques to balance the glands, energize and detoxify. Yoga exercises to activate the frontal lobe of the brain. Meditation to clean out drug residues from the base of the brain. Guidelines for establishing healthy bowel flora, and discussion about the importance and function of the bowel flora. Practicing conscious communication – being aware of from which chakra you are projecting and to which centre in the listener. Develop the ability to communicate from your Original Self and deliver to the heart centre of another, with subtlety. Meditations for effective communication, for thinking before you speak, and to develop the power of expression. Yoga to develop intuition and improve communication. Yoga for the total Self. Cleansing practices, herbs and homeopathic formulas for the lymphatic system. The practical science behind cold showers. Discussion of our True Identity vs, our False Identity/Mask. Techniques to release the past, open to the future. Exercise to strengthen the nervous system and redirect sexual energy to the higher energy centres. Yoga exercises to strengthen the kidneys, release fear, and induce relaxation. Meditation to break addictive patterns. Meditation to remove painful memories and clear emotions of the past. Breathing exercise to strengthen one’s magnetic field and decrease susceptibility to disease. Simple techniques for cleansing and rejuvenating the kidneys. Understanding cause and effect. Developing one’s neutral mind to act consciously, rather than react habitually. Training the mind to serve the soul through yoga and meditation. Tracking the arising of thoughts, feelings, emotions, and desires and developing the ability to witness them and practice discernment before action. Breathing practice to decrease anger, develop calmness. Yoga to balance the hemispheres of the brain and eliminate subconscious memories. Yoga to build oneself to act, not react. Meditations to develop emotional balance and to stop unwanted thought patterns. Simple dietary and herbal cleanses and nutritional supplements to detoxify and regenerate the liver. Discussion of values and virtues as being the foundation for the seven steps to happiness. Importance of commitment, discipline and service in the development of lasting happiness. Breathing meditation to develop a neutral mind that can easily make decisions based on inner knowing. Yoga for expanding and cleansing the lungs and developing a strong magnetic field and presence. Meditations to dispel inner anger and develop neutrality. Yoga and meditations to open and balance the heart chakra. Cleansing practices, foods and herbs for the lungs. Guidelines for smoking cessation. Understanding habits; how they are formed; how they are broken. The importance of commitment, discipline, positive reinforcement and group support in maintaining healthy habits. An overview of a detoxification diet. Examining our conscious and unconscious habits. Learning new habits – how to get up in the morning; how best to go to sleep; how to develop healthy thought patterns. Importance of a daily practice of yoga and meditation, known as Sadhana. Examining one’s projection – how we present ourselves to the world, and how to consciously create our projection through our manners, personal grooming and dress. Breathing exercise to regulate our biological rhythms. Meditations to break habit patterns and develop discipline. Yoga sets for detoxification and for easing into sleep. Dietary and eating guidelines for improving digestion and optimizing function of the stomach and pancreas. Understanding the concepts of dharma and karma. The power of choice – to align with one’s higher self rather than act unconsciously. Meditations to rise above karma and connect with an infinite source of energy. Meditation to improve communication between the hemispheres of the brain. Yoga to cleanse the spleen. Cleansing foods, herbs and homeopathic formulas for the spleen. Discussion of all addictions as displaced spiritual longing – the desire to experience and unite with one’s True Self. Definition and components of Self-Reliance. Examples of how each of us can be more Self-Reliant. Exploration of ways in which we can re-parent ourselves in a healthy manner. Meditations for inner assessment and self-control. Yoga for developing intuition, strength and Self-Reliance. Identification of our values, gifts, talents. Revisiting our history and seeing its role in developing our values, skills, talents. Retelling our stories from a different perspective to gain a new interpretation of our past. Using the gifts, talents, lessons learned from the past in an effective way in the present. Breathing exercises for self-renewal and for the parasympathetic nervous system. Yoga for the nervous system, glandular system and to synchronize and balance the brain. Meditations to create contentment, conquer one’s imagined disabilities and make the impossible possible. Foods, herbs, nutrients and lifestyle practices to strengthen the nervous system. Developing an attitude of gratitude. Defining four aspects of a liberated being, and moving towards manifesting them. Breathing exercises for developing inner beauty and strong nerves. Yoga to strengthen the nervous system. Meditations to recognize one’s Infinite Self and for nervous system strength. Continue to focus on foods, herbs, nutrients and lifestyle practices to strengthen the nervous system. Tracking the ways we spend our time. Allocating time to areas in our lives that have been neglected or that we want to develop, such as creativity, intellectual pursuits, family. Identification of others in our lives (known and unknown) to whom we are responsible, and what we can do for them. Responsibility to the planet. The importance of conscious community – who are the people we want to spend time with who support our spiritual identity? Strategies to build conscious community for ourselves. Breathing and yoga exercises to cleanse the blood, improve our mental outlook, and for self-cleansing and disease prevention. Yoga to combat depression and synchronize the brain. Foods, herbs and lifestyle practices to cleanse the blood. Exploration of the combined role of the liver, kidney, spleen, digestive and immune systems in cleansing the blood. Understanding the power of prayer, and the types of prayer. Develop the habit of heartfelt prayer. Discussion and exercise in forgiveness – of God, oneself, and others. Developing and deepening an attitude of gratitude. Breathing exercises and yoga to strengthen our arc-line and aura – the protective intuitive shield that surrounds our body and composes our electromagnetic field, connected to the universal magnetic field. Meditations to perfect the power of prayer and connect us more strongly to the universal magnetic field. Discussion and exploration of the arc-line and aura and exercises to cleanse and expand them. Develop our ability to listen to our inner guidance, to have the courage and discipline to obey, and to fulfill the promise of our unique destiny. When we recognize the divine within us, we more easily tune into and accept that destiny, and are supported in its manifestation. Breathing exercises and meditations to help us connect to our destiny, to align our will with Divine Will. Yoga for balancing the glands, and awakening the 5th, 6th and 7th chakras. Yoga for the adrenal glands and nervous system. Focus on cleansing the glandular system and understanding the link between intuition, awareness and the health of the pituitary and pineal glands. Exploration of the inner Guru (teacher) and the Shabd Guru. Using the Divine Word or Shabd Guru as teacher and as spiritual therapy. Examples of Shabd Guru from various spiritual traditions. Exploration of the prayer, Japji Sahib, and of the use of recitation of prayer to retune or redirect the mind. Taking a look at attitudes and symptoms that signal relapse. Establishing a list of personal warning signs that can be recognized in advance to prevent relapse. Meditations to overcome all obstacles, avoid fate and to bless others. Yoga for improved flexibility of the spine, and for the navel chakra. Meditations to open the higher centres. Cleansing and careful consideration of our thoughts and words – developing conscious speech with an understanding of the power of the word. Healing through Seva (Selfless Service). Recognizing that the other person is also you. Developing an awareness of others and a desire to assist them, rather than excessive self-absorption. Tool kit for relapse prevention and recovery success. Meditations to enter an ecstatic state, and to bless ourselves and elevate others. Yoga for inner strength and to develop the power to sacrifice. Dedicating our actions to our higher self, God, or others. Recognize Divinity within everyone and serve that divinity without any thought of reward.